Twenty years ago, a fire ravaged the Dillinger family's old homestead, killing Judd Dillinger and crippling his girlfriend. Most people blamed a serial arsonist who'd been around town. But strange things are happening in Prairie Creek, Wyoming, again. Ira Dillinger, the family's wealthy patriarch, has summoned his children home for his upcoming wedding. Eldest son, Colton, and his siblings don't approve of their father's gold-digging bride-to-be. But someone is making his displeasure felt in terrifying ways, setting fires just like in the past. Only this time, there will be no survivors. As fear and distrust spread through Prairie Creek, all the Dillingers and those closest to them are targets and suspects. A killer has been honing his skill, feeding his fury, and waiting for the moment when the Dillingers come home - to die. 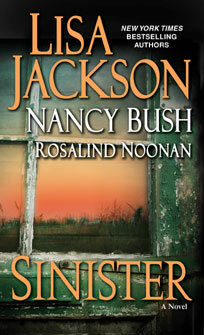 "This collaborative novel has all the tension and suspense that Jackson fans expect. The web of family ties and secrets creates a strong plot. Readers who enjoy shows like Criminal Minds will find the serial killer satisfyingly scary. The authors have each worked their parts of the story together seamlessly. Colton, the eldest son in the Dillinger family, moved to Montana 20 years ago after a house fire claimed the life of his uncle. Now he and his siblings have returned to Prairie Creek, Wyo., for the wedding of Ira Dillinger, the family patriarch, and a much younger woman who Colton once dated. But a serial killer bent on revenge against the Dillingers — a killer who seems to have targeted the family before — is bringing terror to their hometown."